Chapter 21 describes the work done by James Pulham and Son on Madeira Walk, in Ramsgate, in 1894. They were commissioned to return in 1923 to ‘beautify’ the West Cliff Chine, which lies about a mile or so to the West of the town centre. 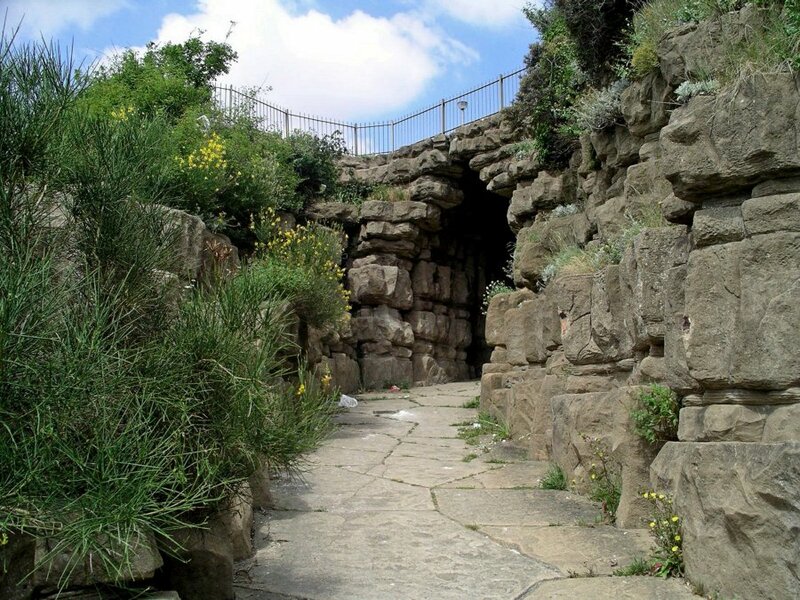 They constructed a pathway leading through high banks of Pulhamite ‘cliffs’, leading to a huge archway and bridge beneath the road above, and it was opened by HRH The Prince of Wales – later to become King Edward VII – on 24th November 1926. The site is now a listed conservation area, and in need of renovation, although the structures are still in quite good condition. At the other end of the town are the Winterstoke Gardens on the East Cliff, created by Dame Janet Stancomb-Wills during the early 1920s. Dame Janet was a cousin of Walter Melville Mills, of the Wills tobacco family, who employed the Pulhams to work on a number of his properties in and around Bristol – such as Rayne Thatch, Bracken Hill and Abbots Pool – as discussed in previous Chapters. She laid out the Winterstoke Gardens near her home, and presented them to the Ramsgate Corporation in 1920. The Corporation incorporated lawns and a Memorial Colonnade on the cliff-top that were opened to the public when she became the first woman Mayor of Ramsgate in 1923-24. There is a length of Pulhamite rockwork along the edges of the Colonnade gardens, and it is quite possible that the Pulhams constructed the entire area. They then returned in 1935 to assist with the conversion of the rocky foreshore and rugged cliff below the Winterstoke Gardens, and a pathway up the cliff, rather similar to the Zigzag Path at ‘The Leas’ in Folkestone, as described in Chapter 40. John Hitching was the Pulham Foreman in charge. A full description of the work done by James Pulham and Son at Ramsgate – together with a number of pictures – can be found in Chapter 41 of Rock Landscapes: The Pulham Legacy – the critically-acclaimed and lavishly illustrated definitive story of the lives and work of James Pulham and Son. Written by Claude Hitching, with featured photography by Jenny Lilly. Published by Garden Art Press. Posted on October 14, 2014 June 30, 2016 by Claude HitchingPosted in Book ContentsTagged . . James Pulham and Son, Claude Hitching, Dame Janet Stancomb-Wills, HRH The Prince of Wales - King Edward VII, john hitching, Memorial Colonnade - Ramsgate, Pulhamite Archway - Ramsgate, Rock Landscapes: The Pulham Legacy, West Cliff Chine - Ramsgate, Winterstoke Gardens - Ramsgate.